The Chinese Zodiac is part of an elaborate system based on Chinese astrology, cosmology, and divination. From China the system spread elsewhere in Asia and has also been adopted to varying degrees in the west. 2015 belongs to the sign 未 wèi in the Chinese Zodiac. This is the eighth of the so-called twelve Earthly Branches, part of a complex system of naming years, months, days, and hours developed by the ancient Chinese. Each Earthly Branch is identified with a different animal, the twelve animals of the Chinese Zodiac. Each of the Chinese Zodiac animal signs is in turn associated with the five elements of earth, fire, water, metal and wood (Wu Xing) in a 12 year cycle based on a lunar year. The elements each have their own set of characteristics that affect the animal signs. These modify the animal signs, making changes to the normal characteristics of that sign. This creates 60 different combinations in the Chinese Zodiac. The concept of Yin and Yang also affect the five elements. For example, there is a Yin Water and a Yang Water. Yin falls in odd numbered years and Yang falls in even numbered years. According to the five elements theory, 2015 is a Yin Wood year. The colour commonly associated with the wood element is green, hence the descriptor ‘Yin Green Wood’ year. As noted, the Chinese character yang represents the current astrological year (2015). Whether this character is linked to a goat, sheep or ram depends on a range of factors. Two countries that identify the 2015 Zodiac animal as a sheep, Japan and Australia, have already been highlighted. 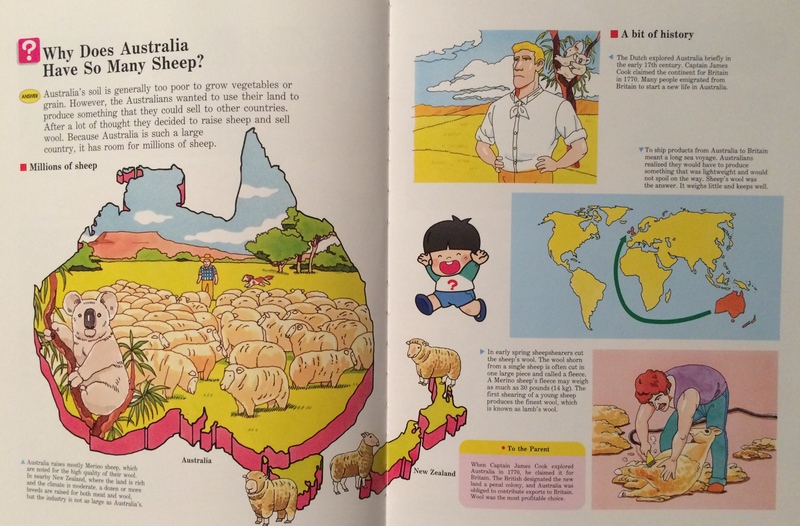 This two-page spread from the ‘Geography and Maps‘ book in the 1996 edition of ‘A Child’s First Library of Learning’ series may help explain why Australian’s identify with the Year of the Sheep. For much of it’s history wool was the main export for Australia, leading to the expression ‘riding on the sheep’s back’. 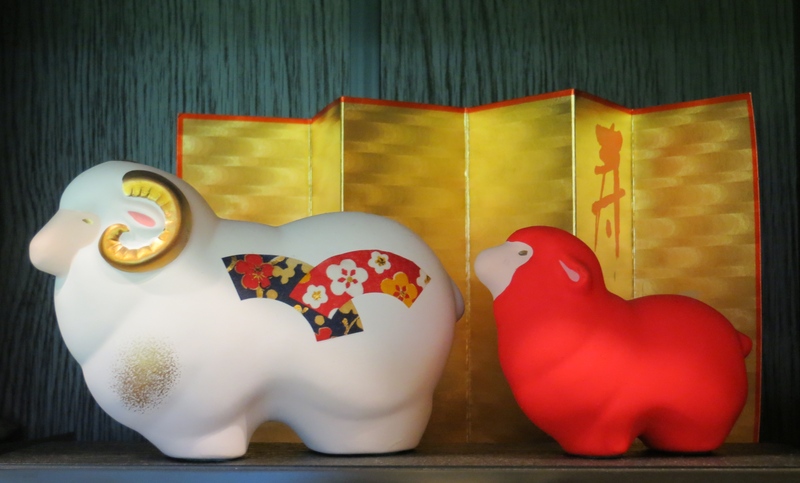 Two ‘Year of the Sheep’ statues, Tsu City, Japan. The yang character (hitsuji) unequivocally means sheep in Japan. In Vietnam they are celebrating the Year of the Goat in 2015 as the eighth of the Earthly Branches is associated only with this animal. Most feng shui experts also identify 2015 as the Year of the Goat. Many say that the yang character looks more like a goat with two horn-like strokes at the top. Perhaps reference to the Year of the Goat is less common in the west as the goat is not commonly domesticated or consumed and is often considered a pest. 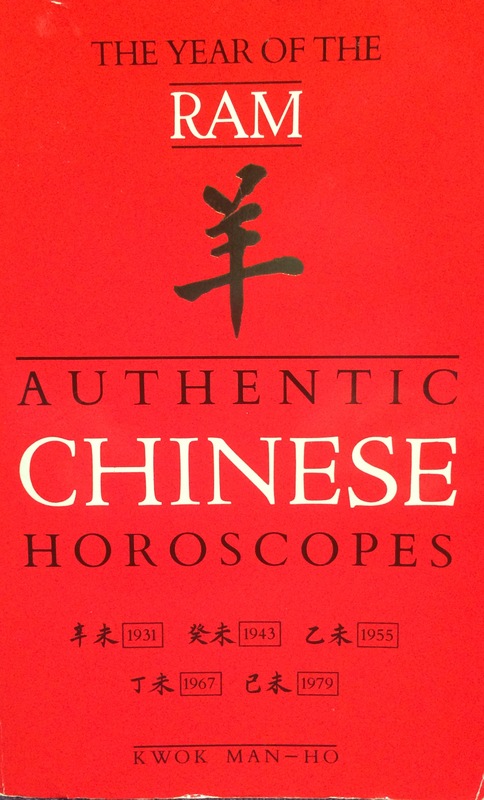 This 450 page book on the Year of the Ram demonstrates that ‘Authentic’ Chinese horoscopes are much more than the twelve animal signs. The five elements and Yin and Yang form an essential part of the complex calculations to draw up a horoscope if you were born in this part of the 12 year cycle. 2015 is not on the cover as the book was published in 1987. The choice of animal is important, as goats, sheep and rams are described with different characteristics in horoscopes. It is only the wood element and the Yin component of this astrological year that are consistent. Having said that, there are many interpretations of the wood element in terms of personality traits, which I’ll leave for another time. 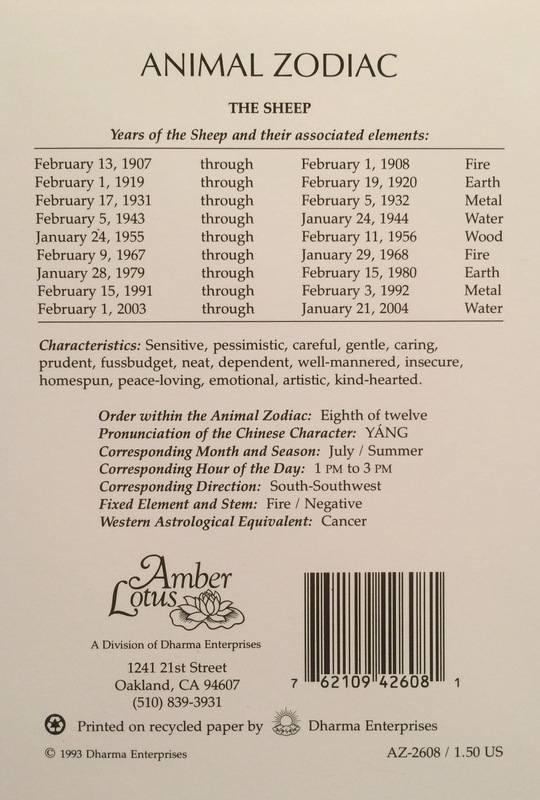 Each animal in the zodiac also has a fixed element, which I’ll also leave for another time. The complexity of the Chinese Zodiac can only be touched on here. Suffice to say that a person born in 2015 in the Year of the Yin Wood Sheep would have a different astrological reading than a person born in 1991, like my nephew Yoshi, which is the Year of the Yin Metal Sheep (see here for a more detailed explanation of the elements in the Chinese Zodiac). 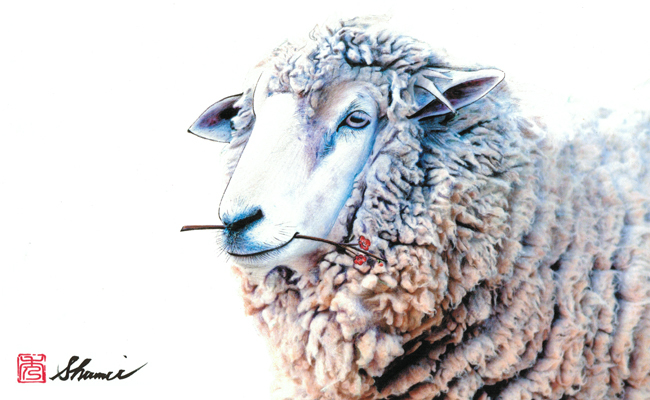 This Year of the Sheep card, printed in the USA in 1993, shows the elements associated with the the 12 year cycle up to 2003. The card refers to a fixed element (Fire), which also has an influence on the type of person you are. It is a complex system once you delve into it. As the Chinese astrological calendar works on a 60-year cycle, the two previous years of ‘Yin Wood Sheep/Goat’ were in 1955 and 1895. Famous people in the west born in the previous year of the Yin Wood Sheep/Goat (1955) include Steve Jobs, Bill Gates, Nicolas Sarkozy, Whoopi Goldberg, Bruce Willis and John Grisham. The first two names on the list have fundamentally changed the way the world works. Coincidence? It would be interesting to explore which aspects of their Chinese horoscopes (e.g. animal, element, Yin-Yang, birth hour, or most likely a combination) may have underpinned their creativity and success. 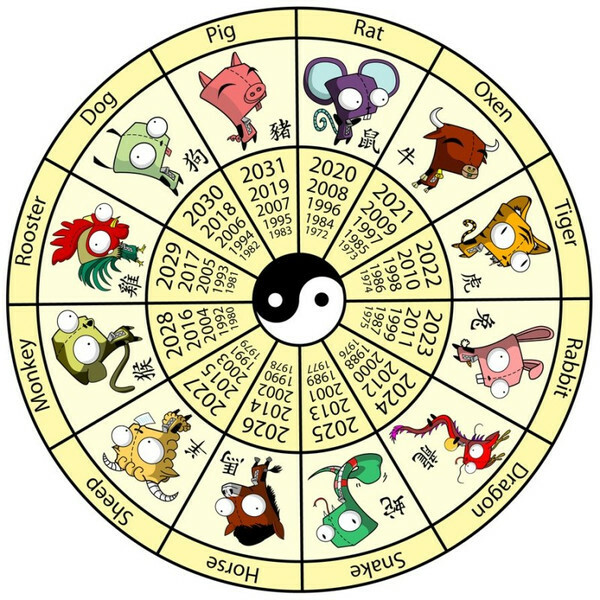 The twelve year animal cycle of the Chinese Zodiac (Source: bjchinatravel.com). Combined with the five elements, this represents a sixty year cycle. 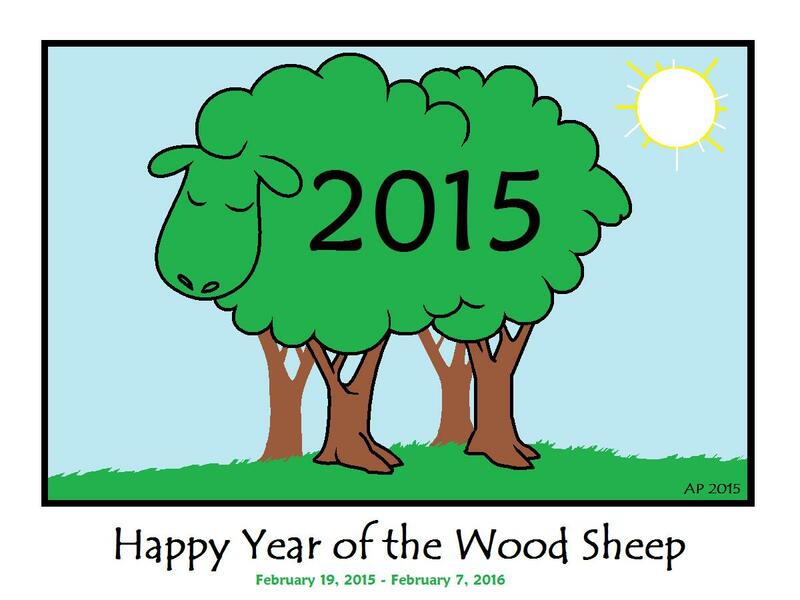 This means that the last Year of the Yin Wood Sheep/Goat was 1955 and the next will be 2075. My nephew Yoshi was born in 1991, the Year of the Yin Metal Sheep. This entry was posted in Australia, Books & reviews, China, Earth, Fire, Japan, Metal, Popular culture, The five elements, USA, Water, Wood, Zodiac and tagged China, earth, Feng Shui, Fire, Japan, the elements, Water, Wood, Wu Xing, Yin-Yang, Zodiac. Bookmark the permalink. I wonder which animal with which element marks the end of the 60 year cycle? That’s a good question John. I’ll check it out and get back to you.